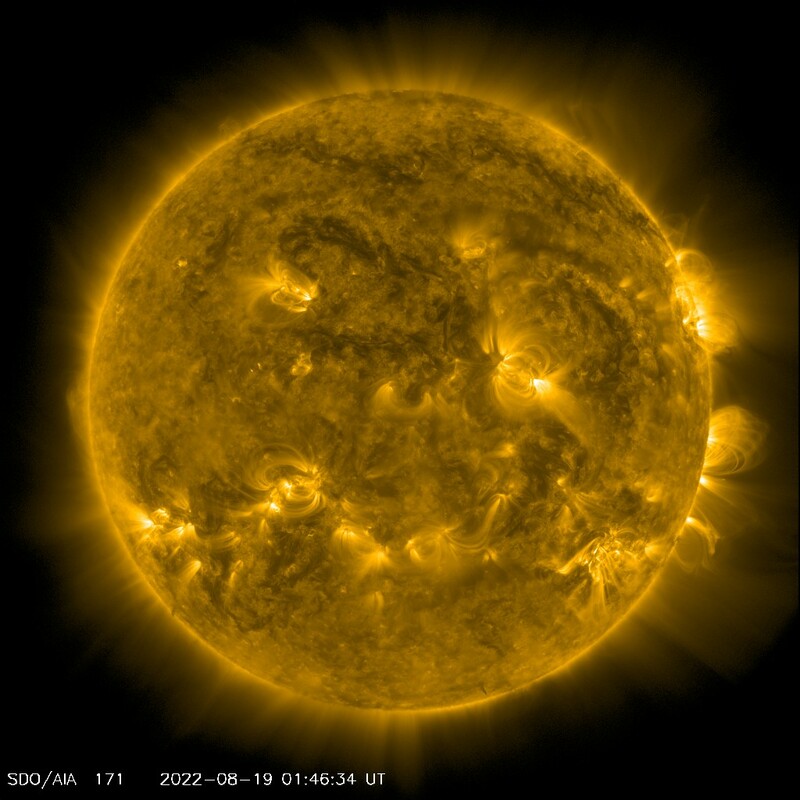 The Solar Dynamics Observatory never fails to deliver absolutely stunning images from the Sun: as of 18:49 UT today, the above picture is what the Sun looked like in the ultraviolet spectrum. The prominence that you are seeing looping off the Sun is estimated at over 700,000 km across, which is about the radius of the entire Sun. Amazing! You can head over to the Solar Dynamics Observatory site to watch this gigantic loop of solar plasma develop in real time. There’s nothing to worry about here on Earth, though – we are safe from such activity on the Sun, even if that prominence is big enough swallow up thousands of Earths. There is no coronal-mass ejection or flare to go along with this prominence, both phenomena on the Sun that can reach Earth and mess with satellites and our power grid. “In visible light, the light from the extremely thin material in the prominence is totally overwhelmed by the intense emission from the Sun’s surface, and is invisible. It’s only when we filter out most of the Sun’s light (and let through light specifically given off by the plasma in the prominence) that we can see it at all,” he wrote. Spaceweather.com also has some other fantastic images that are linked to on their front page. Prominences like this can come crashing down quickly when they become unstable, so head over to the SDO site to watch the action as it develops! The connection to the two sun spots is a bit unclear. Is the magnetic field associated with this prominence emerging from them? @Lawrence: I included the visible light image (with the two sunspots) merely as a reference to show that the light given off by the plasma in the prominence is much stronger in the UV than the visible spectrum, and that this probably wouldn’t be a great prominence to see with a solar telescope (though if there’s somebody with pics from their backyard, do let us know!). To answer your question, I haven’t seen any information indicating that the magnetic field creating the prominence has been directly linked to those two sunspots, but I’m not a solar physicist and I know magnetohydrodynamics on the Sun are complicated. I think it’s safe to assume that they are not necessarily associated phenomena and didn’t mean to link the two, even inadvertently – I changed the caption of the visible light image to better reflect that they are (likely) distinct. Thanks! The optical spectrum picture with the sunspots was on Plait’s BA site as well, so I thought there was some data connection there. It is sort of interesting watching that prominence burst and then collapse. The magnetic field energy holds the plasma mass up against solar gravity. The dynamic evolution appears to spend the magnetic field energy the propulsion of the plasma outwards in this burst. Grumpy face on the sun?